Everyone has bad days. But Victoria’s had months of bad days, and Luna is concerned because Victoria's room smells real nasty. Luna manages to wrestle Victoria out of bed and into the shower, but the challenge is learning to navigate their relationship with Victoria's mental illness in tow. Will everything be okay? Will Victoria ever wash her sheets? This original work explores mental health, self-identity and the bonds of sisterhood. 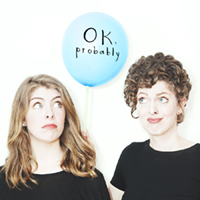 Co-writers/performers Jessica Cuddy and Rhea Rodych promise this play won't bum you out too hard. Probably. Pensive and reflective, the sisters’ relationship undergoes strain through mental illness. A large part of the focus looks through the lens of the sister, and her ability to cope with the person suffering from depression. Seeing more than just the struggles of the afflicted illuminates the dynamics of mental illness and how it affects all those around. This is one of the quietest plays I’ve seen in a long time—intentionally so to give time for the viewer to process. Unfortunately for me, I had my viewing schedule in my pocket and it crinkled every time I moved or crossed my leg. Yikes! I’m the distraction that I so often chastise! I highly recommend that you take anything out of your pockets that may make noise; among the silence, you will be heard!